We have recently worked out that Daddy, as well as being unable to eat things containing wheat and gluten is now also unable to eat things containing egg. Cue much gnashing of the teeth and cursing from me and Daddy suddenly feeling a lot better after removing eggs and egg products from his diet. It has meant that Daddy and I are learning to bake again and so we've been practising on the children! Well, I have and funny enough they don't seem to mind being given cake after cake to try! I'm slowly getting the hang of making light and fluffy cakes without using eggs but with Valentines Day coming up I wanted to perfect it so I could create some lovely cakes for Daddy. 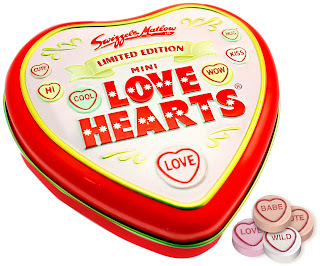 Standing in Wilkinsons I spotted some rolls of Love Hearts by the till and was thinking how cute they would be on a cake, either nestled in icing on cupcakes or if I could work it out covering a large cake completely. And this is how I came up with the idea of making Love Heart Cupcakes. These ones are actually a bit of me cheating as they aren't egg free as I'm made them for Top Ender's Friday lunch (well one of them the other two BB can eat!) and didn't want to be worrying about them not rising. I think that one thing that is really apparent is that I'm really rusty using a piping bag! He's going to get the hint right?